This article was originally published December 2017. As most of you know by now, it looks like Dusk Road is going to drop today. What you may not know, is that the actual release of the set hinges on me completing a review of the 1993 Western Tombstone. Don’t believe me? Well, check out this comment from Scarlatch himself. I for one take Scarlatch deadly seriously. He is not known to goof around in Discord, as he takes representing DWD very seriously. Why does he need a review of Tombstone before the Dusk Road is released? Scarlatch works in mysterious ways, but I am not one to question the process. I am just here to carry out my civic duty. Before we get into things, I will let you in on how things will work. First, I need to insert more Eternal related content into my film review. As most of you know I did a film review of Lonesome Dove so we could get a release date on Omens of the Past. I was told then that I had insufficient Eternal content in that piece, so I will be upping that here. I am sure it will be so seamless that you will barely notice. Second, this week is going to have a whole boat load of content coming to RNG Eternal. Within a few hours of the set going live I will drop a “Hot Takes for Filthy Netdeckers: Dusk Road” article, followed by part 1 of my complete set review a few hours after that. LightsOutAce wrote an article on the cards he is most excited about from the new set, and Flash should be putting out an updated draft tier list as soon as possible. Lots of stuff to look forward to, but for now, let’s talk about Tombstone. Before getting into the content of the movie, I actually learned a surprising amount through watching this movie. I know basically nothing about the history of the old west. “Basically nothing” might be an exaggeration. I know closer to “precisely nothing”. It turns out the term “cowboys” was not just a general term for settlers of the old-west, but rather was the name of a gang that operated in the region. This movie is actually (loosely) based on history, focusing on Wyatt Earp, who took on the cowboys, and includes a rendition of the historic “Gunfight at the O.K. Corral”. Until today I literally didn’t know this was a real thing, but that clever Wikipedia taught me all about it. Clearly this card is dedicated to Wyatt Earp. That majestic moustache and proud stance are emblematic of an accomplished lawman. Like Wyatt Earp, Milos is best when he has a gun and a buddy. I am not sure how the original Wyatt Earp would fare with a Deepforged Plate, but I can only assume it would help him overwhelm his enemies, and endure the attacks of the cowboys. Unfortunately Milos does not seem to be as principled as Wyatt, as he is comfortable hanging out with Bandits, Highwaymen, and Outlaws, while Wyatt was not as comfortable with that. The movie starts with the cowboys coming to shoot up a wedding. I think the director and writer did a good job of subtly indicating who were the “bad guys”. It might have been hard to tell, but if you pay close attention you see them shoot up a bride, groom and priest. Seems like a “bad” thing to do right? This movie is clearly looking like it will use a light touch, and you can miss things if you are not careful. Similarly, my transition to talking about Vicious Highwayman is equally subtle. This card is vicious indeed. He shoots first and asks questions later. 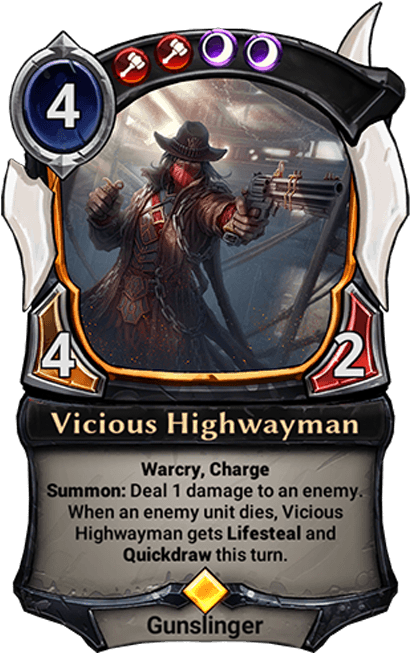 I find the flavor of Vicious Highwayman gaining lifesteal off units dying slightly…. unsettling. Still, this card is devastating in aggro mirror matches, as well decent against controlling decks. It will certainly see some amount of ladder play, but to me it seems situational given its weakness versus midrange. Back to the movie, we are introduced to Wyatt Earp played by Kurt Russel. Once again we are treated to a subtle introduction by the writers. He is well-dressed compared to everyone else, and the first thing he does is stop someone from beating a horse. Is this the good guy? Hard to tell. Just like it is hard to tell if Worldbearer Behemoth is a good card. 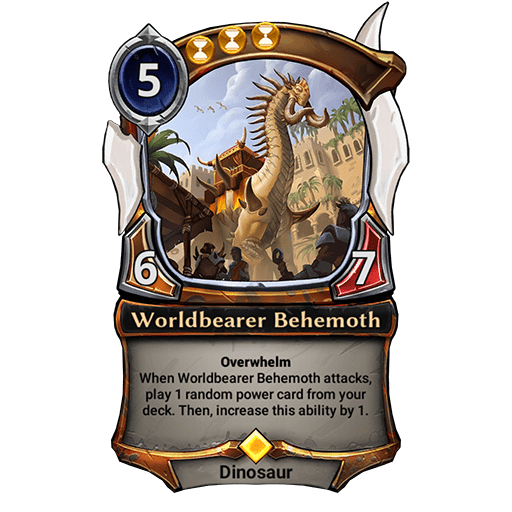 Worldbearer Behemoth is a 6/7 for 5TTT, which is the most stats we have every seen on a 5 drop. He also has an attack ability that let’s you ramp for free. He is part of the Diesel cycle, so that ramping ability grows over time. He also has overwhelm, which means he can get damage in even through a small blockers. Still, it dies to removal, so he is clearly unplayable. Let’s move on. Finally, we are introduced to Doc Holliday played by Val Kilmer. Doc Holliday is truly the highlight of this movie. We start off by watching him playing cards. Immediately, I see someone I can relate to. “I too play card games.” I say to myself. Apparently his opponent’s are getting salty about losing to this guy, and decide to take it out on him by trying to kill him. Doc is no slouch, so he retaliates and stabs this guy. This made me realize that the old-west could really use a #salt channel. Maybe things wouldn’t be so much murdering it people could just blow off steam in Discord? Who knows? Just food for thought next time anyone is trying to set up a frontier society run entirely by machismo and lawlessness. Wyatt and his 2 brothers move to Tombstone to “retire” from the law gig up north. Now, I already have questions, since these men are clearly not that old, but we will forget that. We see very soon that their line of employment they choose for their “retirement” is not particularly restful. What do they do? They essentially take up partial ownership in a local saloon called the Oriental. This is clearly the kind of work you take if you want to maintain a low profile. You find the place with the most liquor, money and guns, and say to yourself THAT is where I can stay out of trouble. Regardless, Tombstone is where Wyatt and his brothers meets up with Doc Holliday, and they begin to amass a fortune working out of the Oriental. Solitude costs a lot and does very little. Sure it may seem unpleasant at the time, but at the end of the day unless you actually kill someone with this, it seems like nonsense. 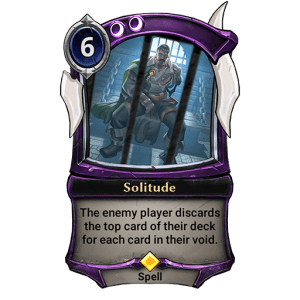 Still….. ahhh….. something something Tombstone… something something… Dusk Road…. uhhhh…. don’t play this card. BACK TO THE MOVIE!! After the sheriff is killed Wyatt’s brother decide to step up and become sheriffs to fight back against the cowboys. Wyatt is understandably not happy about this, since he is much more focused on making money. Tension in town builds until it eventually leads to the gunfight at the O.K. Corral. This is a pretty sweet gunfight scene by 1990’s standards, but I have gotta say the counting of bullets here is looooose. It seems like ever revolver shoots at least 10 times and each shotgun fires like 4 times. As long as you don’t pay attention to that, the scene is a lot of fun. Most importantly, Doc Holliday lets us know that “I’m your huckleberry”. I literally don’t care what happens in the future, this will still always be my #1 emote. Jekk, Hunted Fugitive is the Fire member of the Diesel cycle. Wyatt is clearly not a hunted fugitive, but he is certainly making the cowboys into hunted fugitives! He is also giving out guns to all the people who are working with him, so he is kinda like Jekk in that way too. He also seems totally impossible to beat in combat, which is obviously similar to Jekk. I now suddenly want the alternative movie where Wyatt Earp goes into battle with a horde of heavily armed Grenadin. That seems sweet. Anyway, we get a montage of Wyatt and friends breaking up the cowboy gang. Eventually the “big bad” cowboy challenges Wyatt to a duel. Things work out that Doc Holliday gets to the duel before Wyatt, and the leader of the cowboys is killed by Doc without much fanfare. Importantly, we once again hear that Doc Holliday is our huckleberry. Once this is complete we get another montage of killing cowboys. Through about half the movie it has been clear that Doc Holliday is very sick, but now is the point that he finally dies, after which the film ends shortly afterwards. Eilyn, Clan Mother is clearly meant to be a positive representation of women. Mom comes down and lays down the law, telling everyone to shut up. Then – if they are still causing a problem – she sends them to their rooms (dealing 6 damage). Having endurance is also clearly a reference to how mothers never get exhausted, and need to endure so much. It also seems like Eilyn has an important impact on the plot of the upcoming story, given that she is standing in front of the Eternal Throne. DWD’s representation of women is quite noticeable while Tombstone’s is totally forgettable. Outside of this, I certainly enjoyed the movie. Val Kilmer as Doc Holliday was honestly a pleasure to watch. Everything else was totally fine, if fairly 1-dimensional. The plot seems to be a little wonky to me, but my tolerance for that is pretty high in any film that is trying to even remotely parallel real life events. It is hard to always piece together (or fully explain) the sequence of events that leads to real life things actually occurring. That concludes my review of Tombstone! This will obviously be used to power the DWD servers so that it can send out the fresh cards tomorrow. The mechanism by which it is used is slightly obtuse, but I am under the impression LSV, Chapin and Scarlatch print out the review and use it in some sort of shamanic ritual to summon the new cards. I have also heard that your comments on the Reddit thread are helpful to power the incantations, so be sure to share your thought on Tombstone, Set 3 or Shamanic rituals. Do you have a tortured connection to make between 1990’s westerns and the Dusk Road? Be sure to share it! I’ll talk to you all very soon…..